Labeled as the fastest track on the calendar, Monza was expected to deliver an exciting Sunday afternoon, with expectations raised to the roof by the home name – Ferrari. The team has already proved this season that they can find what it takes to beat the almighty Mercedes – even if they don’t have that magic element permanently in place. The Ferrari engines were expected to thrive on the long straights in Italy and they nearly did the unthinkable: beat seven-times straight pole sitter Lewis Hamilton to the front line. Albeit not exactly P1, Kimi Raikkonen did indeed find himself starting the race from the front row, with his team-mate Sebastian Vettel right behind the Brit, in 3. The leading setup was complemented by Hamilton’s team-mate Nico Rosberg, who’s weekend was quickly turning from bad to worse. The German was starting the race on a back foot, not only in terms of grid position, but also due to the technical issue with his Mercedes which had been the cause of a poor qualifying (in Silver Arrows’ terms): the current championship title runner-up had to race with an old-spec engine after his new unit failed due to a leak from the car’s cooling system. The rest of the qualifying results were rendered somewhat irrelevant by the whole array of penalties handed to the drivers ahead of the race. Toro Rosso’s Max Verstappen, for example, was sure to start from the back of the grid after not setting a time in the first part of the session, which only added to his existing 30-grid place penalty for changing over a power unit beyond the allowed limit for the year. If that wasn’t enough, he was due to serve a drive-through penalty in the first three laps of the race for shedding a significant part of his bodywork on Saturday afternoon, which the stewards classed as unsafe release. Red Bull are but a shadow of the championship winning team from a few years ago, and the outfit is looking for a new engine supplier to change that. Photo by Mark Thompson/ Getty Images. 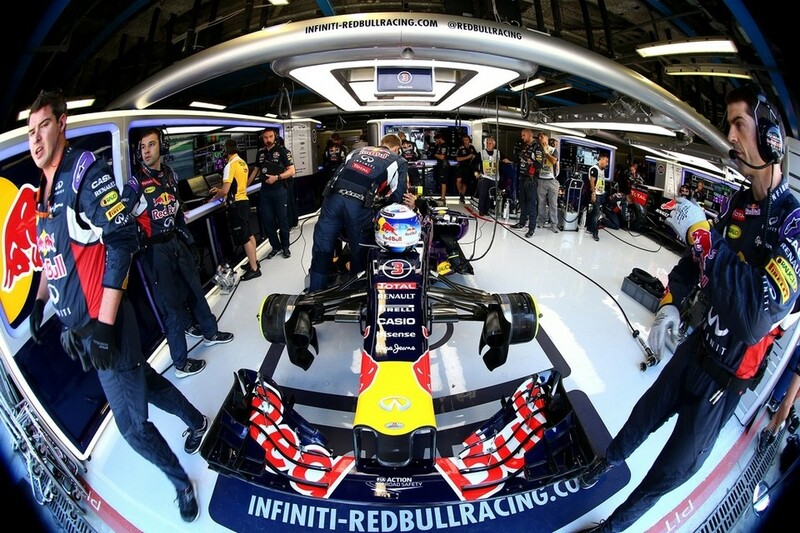 His team-mate Carlos Sainz, as well as the sister outfit’s Daniil Kvyat in his Red Bull, were both handed 35-grid place penalties for new engines and turbos. Kvyat’s team-mate Daniel Ricciardo cherished qualifying in 15. after a quick turnaround of his car due to a double engine change in one day, which at the same time handed him a 50-grid penalty for yet another power unit above the allowed limit. So, with Ferrari at the front and with fighting potential, and some fast and daring drivers at the back, it looked like we’d have a race on our hands – except, we didn’t. The biggest surprise of the afternoon came as the lights went off, but Kimi Raikkonen remained stationary. As it turned out later, an issue with his clutch positioning (or, at least, that’s what the Finn claims) was the root cause of the terrible start, which dropped the 2007 champion to 18. place on the first lap. He fought his way though the field, however, to eventually finish 5. 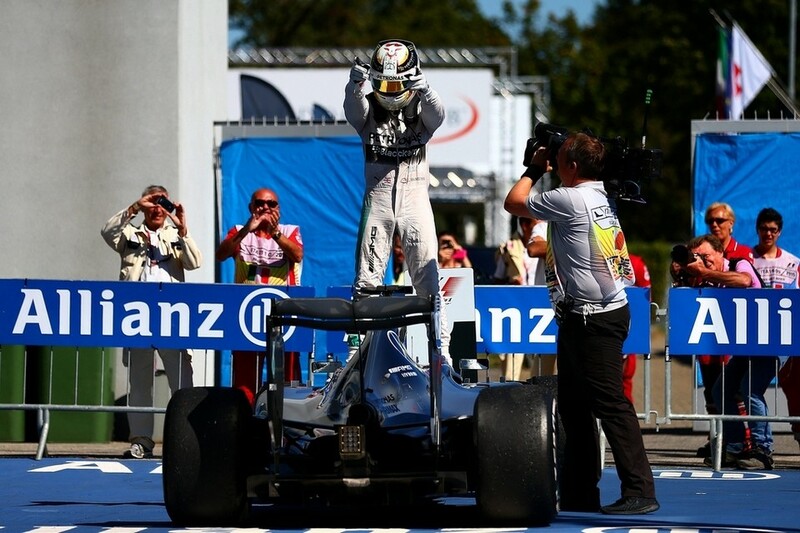 – which still was, considering the setup prior to the race, a far cry from the podium finish the home crowd was hoping for. Raikkonen’s sluggish start also affected Nico Rosberg who had to take avoiding action starting right behind the Finn. That put an unnecessary strain on the already limping Mercedes as he got swamped by the rest of the front-runners and had to fight the spirited Williams to challenge for the podium. His used power unit was not liking the resistance to overtaking shown by Valteri Bottas, and appreciated the well-planned pit stops that worked as an undercut, naturally reshuffling the grid to put the Mercedes ahead of the Finn and his team-mate Felipe Massa. 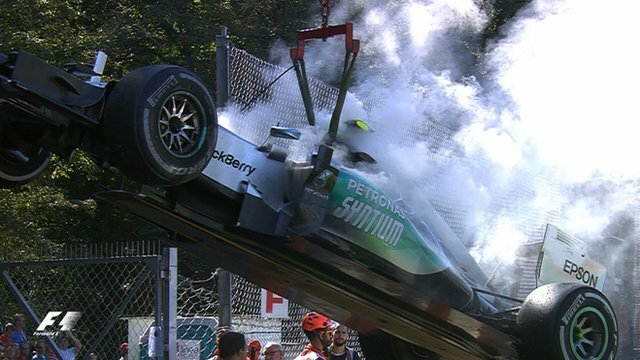 The decision to turn up Rosberg’s “second-hand” engine might turn out to have cost him more than just a few points. Since it looked like a one-stop race for all, it seemed like that would be the finishing picture: championship leader Hamilton way ahead of everyone, gone in the distance, followed somewhere by Vettel and the Brit’s team-mate Rosberg; but in final stages of the race the German looked strong to challenge his Ferrari compatriot for the second podium spot… and then, his engine blew up and his race was finished. As it later turned out, the team had turned up Rosberg’s engine to give him more “oomph” to challenge Vettel – a decision that proved extremely costly, one that, in fact, might have robbed the German of the title this year. Rosberg’s unexpected retirement opened the doors for Williams to claim a podium spot – and who better to make that claim than the crowd’s favourite, former long-term Ferrari driver, Felipe Massa. 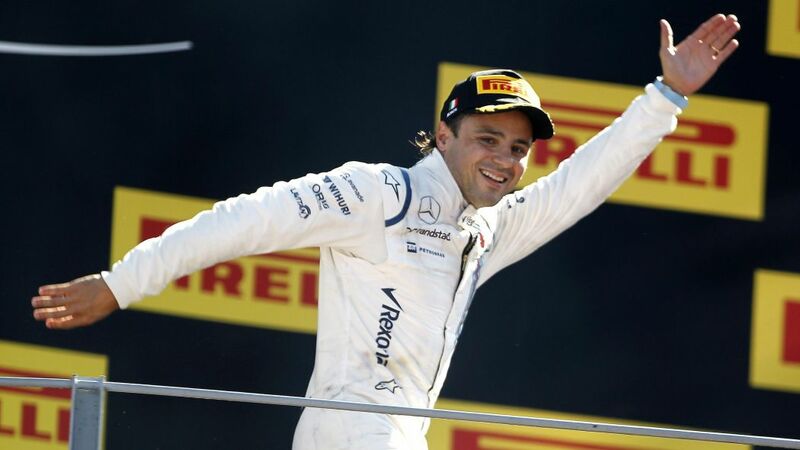 The Brazilian’s win, and Kimi Raikkonen’s poor show, has promoted Massa ahead of the Finn in the championship standings. Ageing Superman – although not any more at Ferrari, Massa’s third place finish was greeted as a success of their own by the Monza crowds. Although the crowd embraced the Brazilian’s third place finish, they were even more ecstatic about Vettel’s podium spot – and the four-time chapmion was equally delighted calling it his “best second place finish”. 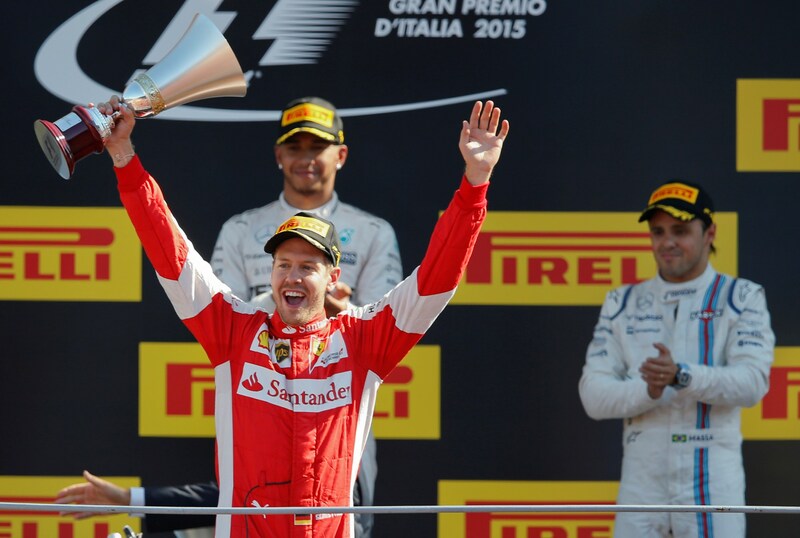 This cheerful attitude on behalf of Massa, Vettel and the Italian crowd was a sign of acceptance by the F1 world of the current state of play, where Mercedes dominates with their star Hamilton well set to claim his third career title, making it a seven-win 2015 tally in Italy. But it wasn’t as comfortable a win as always, and Hamilton admitted that on the celebratory-lap team radio and post-race interviews; he was put under pressure in the last laps of the race when he was told by the pit wall: “We just need good lap times now, no need to ask questions”. As it turned out, the team was concerned about tyre pressures on the Mercedes, but not in case of a critical blowout, rather – because of the sport regulations. According to those, if a car runs on compounds with pressure below the limit set by the tyre manufacturer, the driver in question can face a serious safety penalty – disqualification. The broadcast radio message got everyone wondering about Hamilton’s issue, and once it became clearer what the issue was – whether he’d keep his Italian win. But, alas, after some discussion and data reviewing, the stewards decided to let this one pass. The current F1 state of play: four-time champion celebrating his best ever second-place finish. While Mercedes could eventually celebrate a lucky escape, two teams in particular did not enjoy their Italian GP: McLaren Honda’s woes continue, with Jenson Button finishing in 14. and only ahead of two Marusia, and Fernando Alonso retiring late in the race due to a power unit failure. Although the team carries some hopes into Singapore expecting the circuit to be more suited to their chassis, the success will be counted in the number of positions from the back of the grid when – if – the two drivers cross the finish line. While Lotus had a disastrous afternoon that finished as soon as it started – Romain Grosjean parked his car on the side of the track on lap one and Pastor Maldonado retired into the garage just after with the floor of his car cracked in two due to the impact of running over the kerb when taking avoiding action in the first lap car bunch up. The retirements could not come at a worse time as talks about the outfits’ financial woes escalate, and their only hope remains being bought up by their engine supplier, Renault. The performance of these latter teams might suggest some imminent changes to the F1 grid – but not necessarily the changes the fans are hoping for.